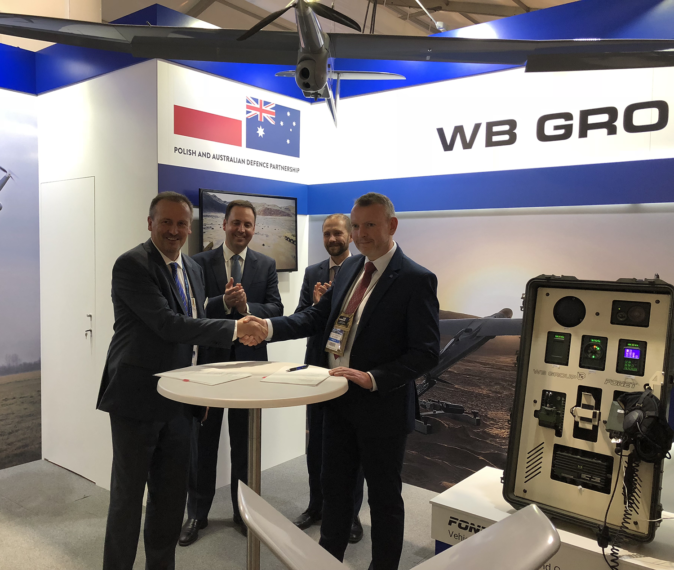 WB GROUP is pleased to announce that it has signed a formal distribution agreement Australian partner, CABLEX, to offer WARMATE, a loitering munition, combat unmanned aerial system (C-UAS). The agreement with CABLEX stipulates that the Company will be the local systems integrator and distributor of WARMATE in Australia. The agreement was signed in the presence of the Australian Ministry of Defence Industry Mr. Steven Ciobo and the Polish Ambassador in Australia, Mr. Michał Kołodziejski. “We are pleased to offer Australia’s defense forces with a high-quality loitering munition” – said Piotr Wojciechowski, the president of WB GROUP. “The agreement means not only provides the Australian military with aerial detection and strike capabilities, it also strengthens the bilateral cooperation between the two countries in the defense sector”. Loitering Munition System WARMATE is designed by WB GROUP in order to support overwatch and strike operations against enemy personnel and light armored vehicles. The system supports the operator during totality of mission phases. There is a special guidance tool facilitating the target aiming phase when the warhead is in ARMED mode. The cooperation between WB Group and CABLEX is effective immediately and is an extension of the agreement signed between the two companies in 2017.